Wow... Plain on the outside, but like stepping into the past inside... Tables on the stage and cardboard cut-out characters in the stalls. It's great how Mr J.D. Saves these old buildings... Great beer as always; I had Elgoods Hickathrift 4.3%, Hop Monster Co. Snake Oil Stout Dark 5% and a Wards strong xmas ale. I'm just down for a week, but as there are some footie posts on here - Leicester City - top of the premier league - Keep the faith! An interesting interior, the sort of building conversion that Wetherspoons do well. A good selection of well kept, well priced ales - no complaints! 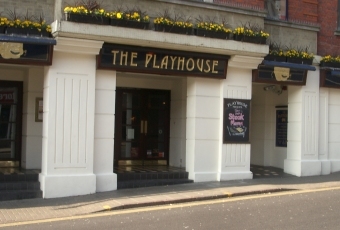 The relatively plain exterior of this former theatre belies the amazing interior which comprises of tables on the stage and stalls area with the circle given over to a recreation of the theatre's audience in its late Victorian heyday. There are plenty of nooks and crannies as well as a fair few quiet snugs which means you can have a meal in peace even when the place is busier. Good value, wholesome food as with most Wetherspoons - over 10 real ales on and in reasonable condition. As with many Wetherspoons although the interior is spectacular it is also a little worn, and as always some of the clientele leave a little to be desired, however the place is big enough to find a seat to avoid any undesirables. Close to the town centre and a good stop off if you want good value food and beer. Monkdawallydahonk ... I popped in here before ColU vs Gillingham and we won!! Change your routine!! Not a bad pub, but as you say there are better in town.